There are two parameters that determine our collective carbon dioxide (CO2) emissions: the number of people, and quantity emitted per person. We either talk about total annual or per capita emissions. They tell very different stories and this often results in confrontation over who can really make an impact: rich countries with high per capita emissions, or those with a large population. 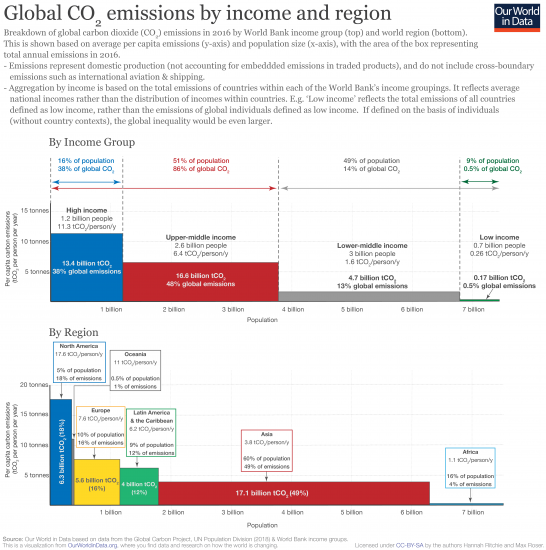 To help us understand the global distribution of per capita emissions and population, we have visualized global CO2 emissions below by (1) World Bank income group and (2) by world region. Note here that the summary by income is on the basis of country income groupings, rather than that of individuals. For example, &apos;low income&apos; is the total emissions of all countries defined as low income, rather than the lowest income individuals in the world. These figures therefore don&apos;t take account of inequalities in emissions within countries. It&apos;s estimated that within-country inequalities in emissions can be as large as those between countries.4 If we were to calculate this distribution by the income of individuals, rather than countries, we&apos;d see that the global inequalities in emissions would be even greater. The richest of the global population would be responsible for an even larger share of global emissions. When aggregated by region we see that North America, Oceania, Europe, and Latin America have disproportionately high emissions relative to their population. North America is home to only five percent of the world population but emits nearly 18 percent of CO2 (almost four times as much). Asia and Africa are underrepresented in emissions. Asia is home to 60 percent of the population but emits just 49 percent; Africa has 16 percent of the population but emits just 4 percent of CO2. This is reflected in per capita emissions; the average North American is more than 17 times higher than the average African. This inequality in global emissions lies at the heart of why international agreement on climate change has (and continues to be) so contentious. The richest countries of the world are home to half of the world population, and emit 86 percent of CO2 emissions. We want global incomes and living standards — especially of those in the poorest half — to rise. To do so whilst limiting climate change, it&apos;s clear that we must shrink the emissions of high-income lifestyles. Finding the compatible pathway for levelling this inequality is one of the greatest challenges of this century. [Clicking on the visualization below will open it in higher-resolution]. All data is based on 2016 emissions data from the Global Carbon Project (GCP). Note that this is based on domestic production (not accounting for embedded emissions in traded products i.e. consumption), and do not include cross-boundary emissions such as international aviation & shipping (often termed 'bunkers' within emissions accounts). If you want to see the difference between consumption and production-based emissions you can find them in our main entry on this topic. This is based on the visualization used by the late David MacKay in his book, Sustainable Energy - Without the Hot Air. His book is free to read and download online, here. Global emissions in 2016 (minus cross-boundary emissions), as the sum of those in the chart below, was approximately 34 to 35 billion tonnes of CO2. Adding one billion individuals with a per capita footprint of 11.3 tCO2 per person per year would equal an addition 11 billion tonnes of CO2 per year (1 billion*11.3 = 11.3 billion tonnes). This is equivalent to almost one-third of global emissions in 2016. See Chancel, L. and T. Piketty (2015), "Carbon and inequality: From Kyoto to Paris. Trends in the global inequality of carbon emissions (1998-2013) & Prospects for an equitable adaptation fund", Paris School of Economics, Paris. Available at: Chancel and Piketty, 2015.